Bullet casting in the U.S., whether by individual shooters or by commercial bullet makers, seems to be gaining in both popularity and volume. The introduction in recent years of handgun shooting sports that require the use of cast lead bullets, for safety or economy, has lead many shooters to send an ever-increasing number of commercial or home-cast bullets downrange. Another group of shooters who have returned to using cast bullets instead of jacketed bullets is big game hunters. Hunters seeking the largest game animals have found that a high-quality cast bullet of proper weight, design, and alloy can be relied upon to give deep penetration and tissue destruction when used against dangerous animals. Whatever the reason, shooters have been using more cast lead bullets than ever before. The availability of high quality commercial cast bullets at fair prices has been of great benefit to shooters who do not cast their own. A few of these bullet casters, such as Cast Performance Bullets (see Jeff's article on Cast Performance bullets at Cast Performance), specialize in super-tough bullets for the hunter who demands only the best. Most commercial bullet casters, however, cater to the shooter who needs bullets for competition or plinking. In this endeavor they are successful, as the accuracy and quality of most commercial cast bullets are good enough for the demands of most shooting sports. Many shooters, for whatever reason, are into casting their own bullets. In doing so themselves, they have absolute control over the quality and hardness of the bullet alloy. Also, a shooter who casts his own bullets has an almost unlimited number of bullet designs and weights from which to choose, as opposed to the relatively few available from the larger commercial casters. 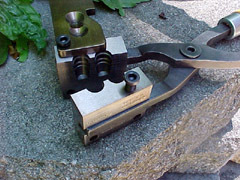 A shooter who casts his own bullets can sometimes obtain the raw materials, such as lead and tin, for little or nothing from scrap metal dealers or tire stores. There is also the satisfaction of shooting bullets that you have made yourself, in your own basement or on your back porch, that adds another bit of enjoyment to the pleasure of shooting. 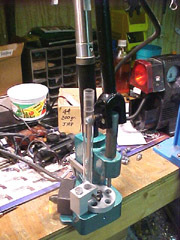 To this group of shooters who prefer to cast their own, the most important piece of equipment besides a good mould is the sizer-lubricator. 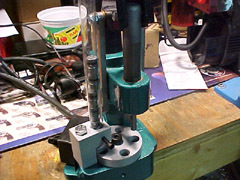 There are several good bullet sizers on the market that size and lubricate the bullet in one step. All of these of which I am aware are of good quality and well suited to the individual bullet caster. Some are slower than others, but all basically do a good job. The best of these, however, is the new Mark VI Mini-Sizer from Ballisti-Cast, Inc. of Plaza, North Dakota. Ballisti-Cast is a company that makes large casting machines for commercial bullet casters who must cast many thousands of bullets per hour. This kind of volume is not needed and cannot be financially justified by most shooters. 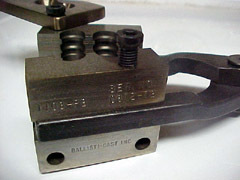 Thus the introduction of the Mini-Sizer by Ballisti-Cast. Just so that you don't think that the Mini-Sizer is a small machine that is incapable of high production; the Mark VI Mini-Sizer can size and lubricate 2500 bullets per hour. The basic design of the Mark VI is similar to the Star machine, but with some improvements. The design of the Mark VI is such that no nose punches are needed as are on most other sizers on the market, as the bullets are pushed nose first through the Mark VI, with the nose of one bullet pushing against the base of the bullet before it. The bullets are fed from a clear tube into a revolving carriage, depositing each bullet into the sizing die. The die is longer than competitive dies, giving more surface to achieve the bullet constriction to the desired size, resulting in a better bullet surface with no smearing. 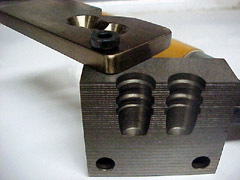 While in the sizing die, the bullet is lubricated, then pushed out the bottom of the die by the next bullet. 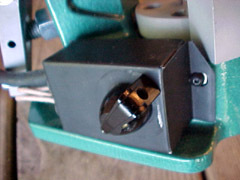 The Mark VI also has a lube heater built into the machine that assures that the lubricant flows smoothly and evenly into the lube grooves of the bullet. The lubricant is forced into the grooves by air pressure regulated to a constant and consistent flow with each pull of the handle. 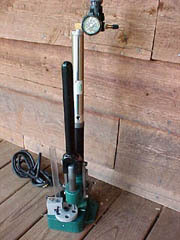 I hooked to mine a small compressor onto the Shrader valve supplied with the machine. The result was a evenly well-lubricated bullet with each pull. The construction of the machine itself is both heavy and impressive. Upon first inspection of the machine, one gets the impression that this thing is built to last a long time. I know of at least one commercial caster who specializes in high quality hunting bullets that uses this machine with excellent results. Every component of the Mark VI is overbuilt, with enough strength in each major part to last for many years. Comparing this machine to most others on the market is like comparing an anvil to a tin cup. 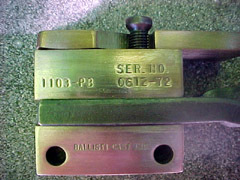 This is not to degrade the quality of the other sizers, but to show the relative strength of the Ballisti-Cast product. It is strength that may be needed when sizing several hundred hard lead bullets in one session. 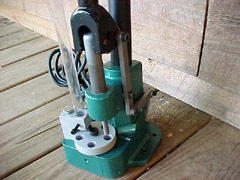 If you have not seen one of these machines in your favorite reloading supply store, don't feel alone. Dennis Edwards, who owns and operates Ballisti-Cast, Inc., would not ship any machines until he had everything just right. For this he is to be commended. I first saw the Mark VI at the 2001 SHOT Show (see article at SHOT Show Day 2), and a couple of months later I received one for testing. It was definitely worth the wait. For more information call Ballisti-Cast at: 701-497-3333 or find their website at www.powderandbow.com/ballist. While looking over their website, don't overlook the excellent bullet moulds available. Ballisti-Cast manufacturers some of the finest bullet moulds on the market, with a wide selection and quality second to none. The Ballisti-Cast Mark VI Mini-Sizer is a robust, ingeniously-designed unit built for strength, precision, speed, and ease of use. The Mark VI Mini-Sizer is a both heavy and impressive, with all components overbuilt for long life. Bullets feed nose-down, eliminating the need for nose punches. This saves the consumer time and money. 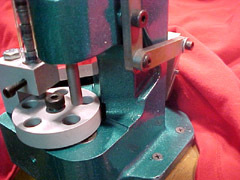 Bullets are shown inserted into the clear feeding tube, ready to enter the revolving carriage that moves each bullet into the sizing die. The Mark VI comes equipped with a lube heater, insuring a smooth and even flow of lube into the bullet's lube grooves. 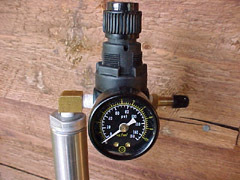 Lube is forced into the bullet's lube grooves by air pressure, controlled by this regulator to a constant and consistent flow. The Mark VI Mini-Sizer has found a place of honor on the author's loading bench. He was very impressed with the Mark VI's quality! While the Mark VI will work with bullets thrown from any brand of bullet mould, the author highly recommends Ballisti-Cast's own bullet moulds. They are some of the finest moulds available at any price, with a wide selection of bullet designs available and quality second to none.